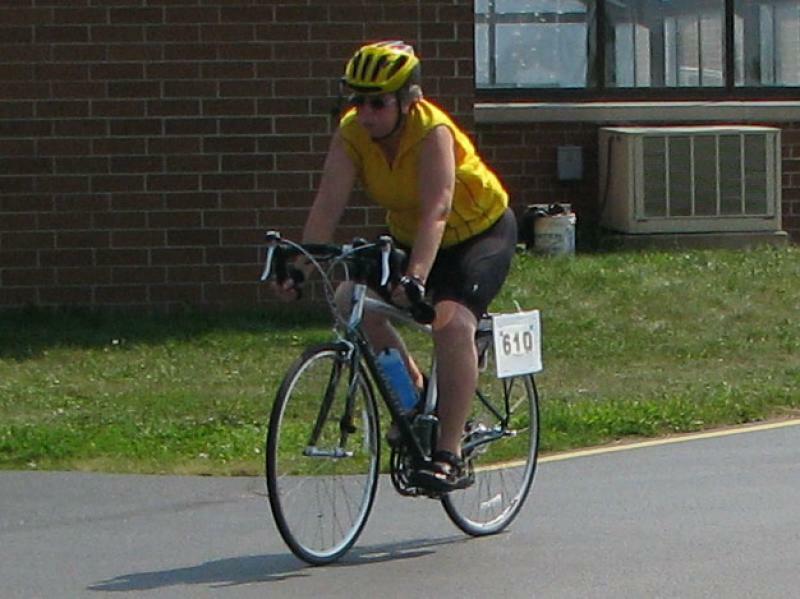 Races held August 15th & 16th 2009 at the North Manchester high school. Thanks to race director Jeff Hunn, Timing official Luke Gilberts, and all the volunteers. 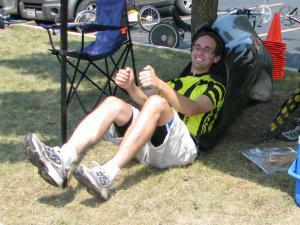 Tiltin' Tim Hicks gets caught with his hand in the cookie... er... french fry bag. Tim left the races with several abrasions and bruises, but that didn't stop him from racing hard during all of the events. 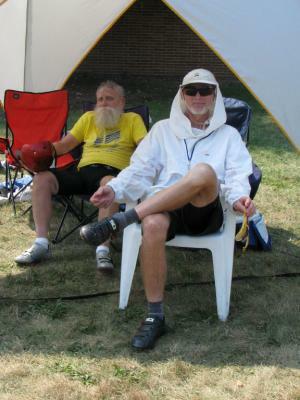 In the background are Warren Beauchamp, Garrie Hill and Dennis Grelk. 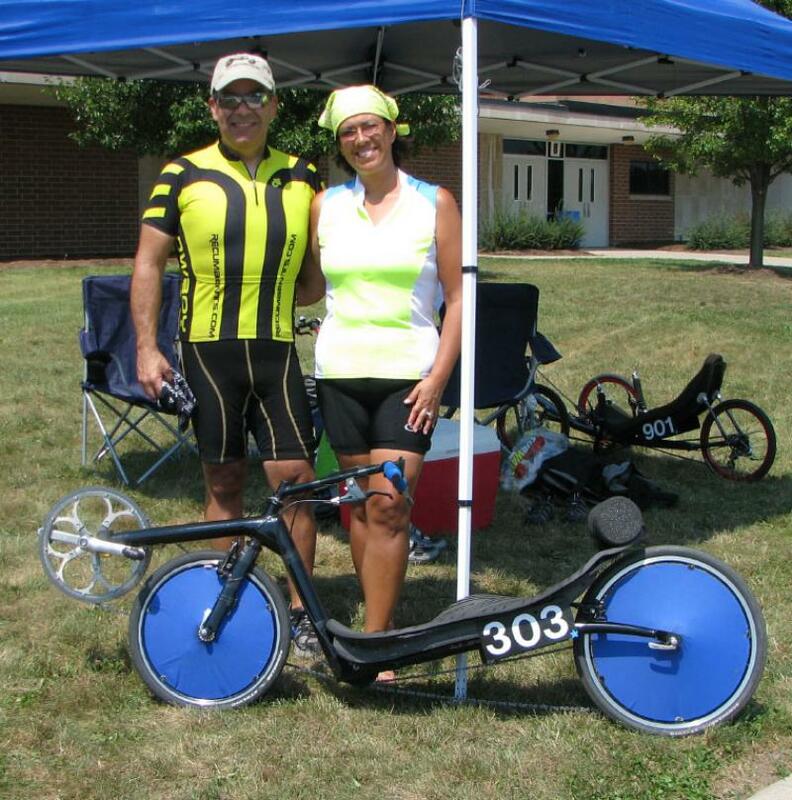 Photo by Curtis Valey Chris and Dora Cortez with one of their Gritters lowracers. 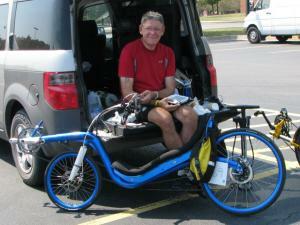 Warren Beauchamp with his Velokraft NoCom. 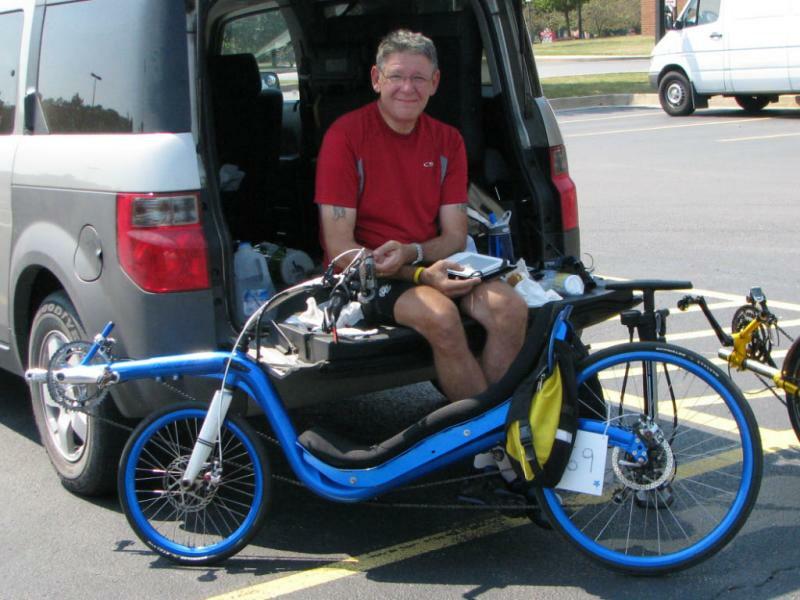 Photo by Curtis Valey Steve Wood with his electric blue Challenge Jester. 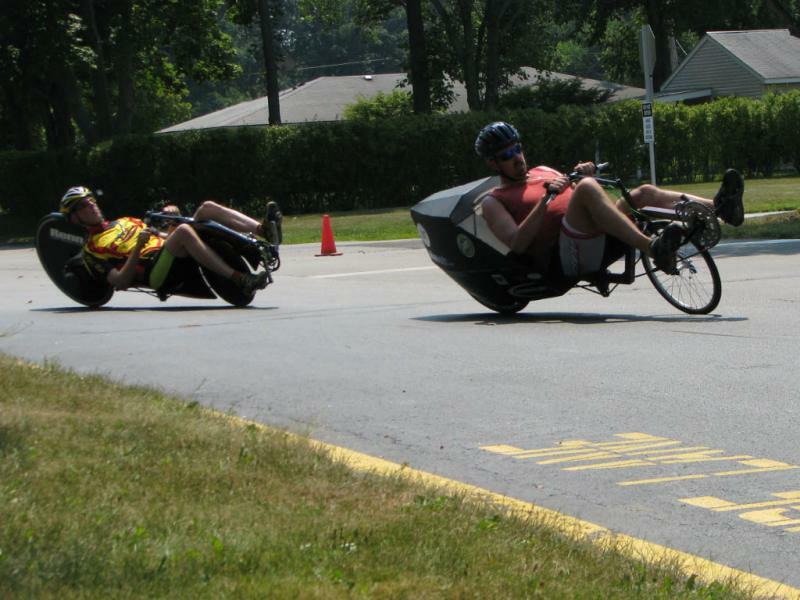 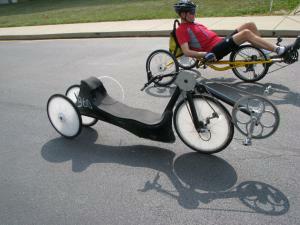 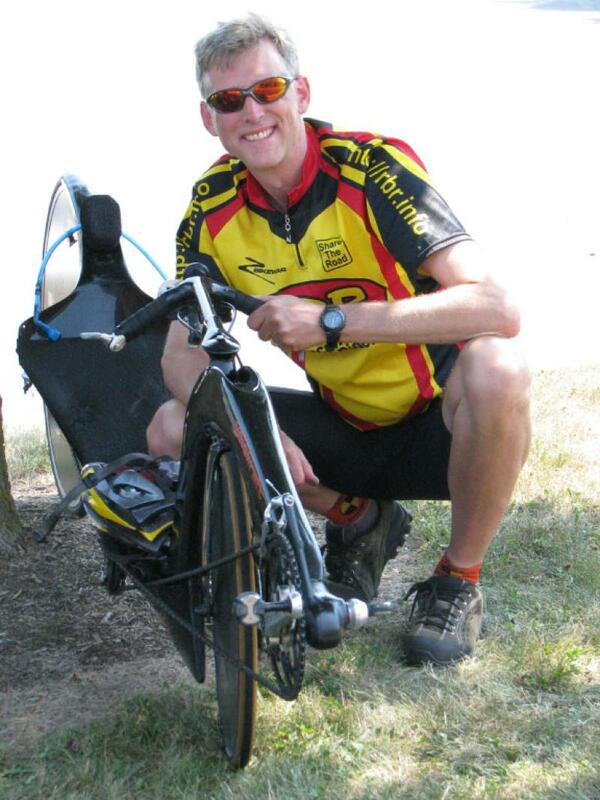 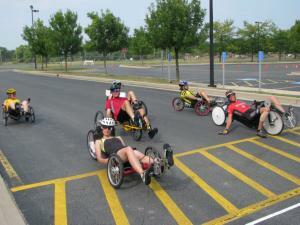 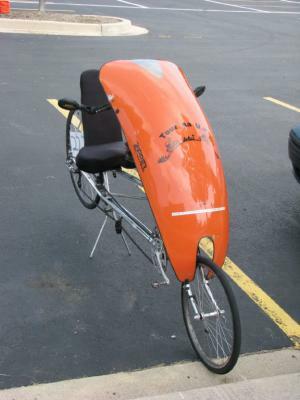 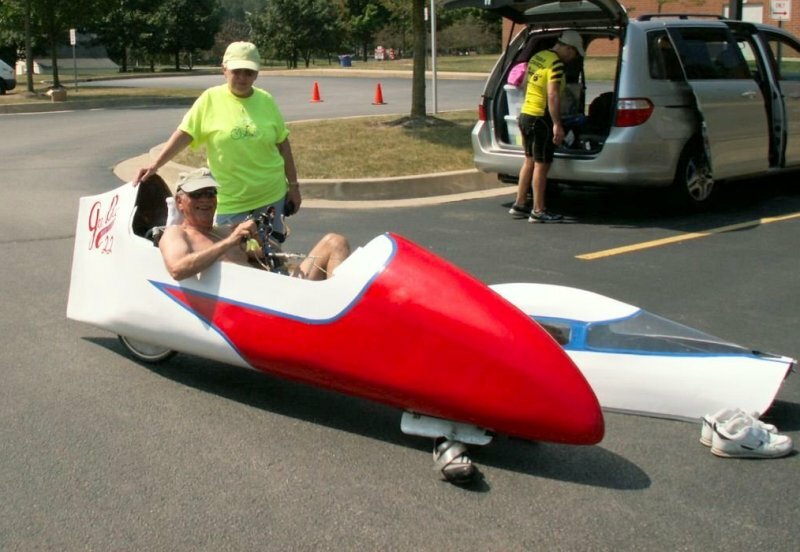 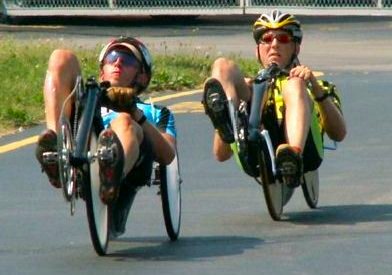 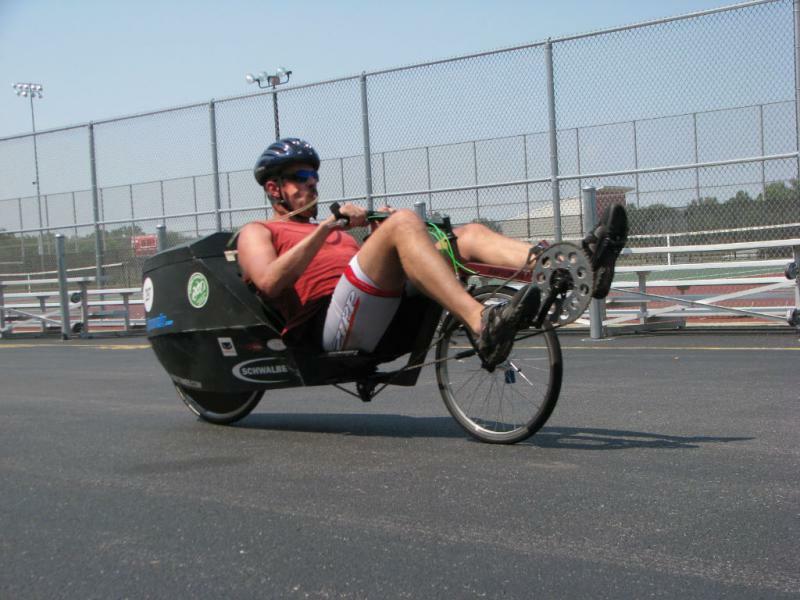 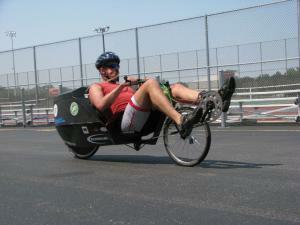 Steve drove all the way from Texas to race this bike and his recumbent trike. 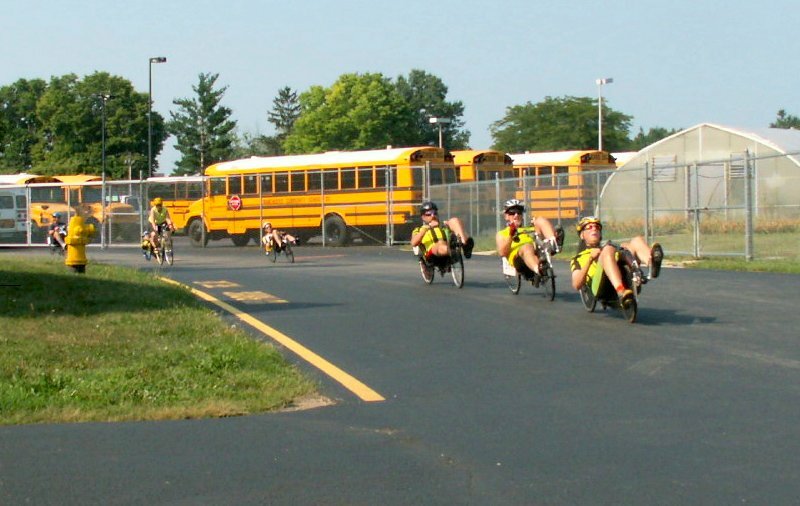 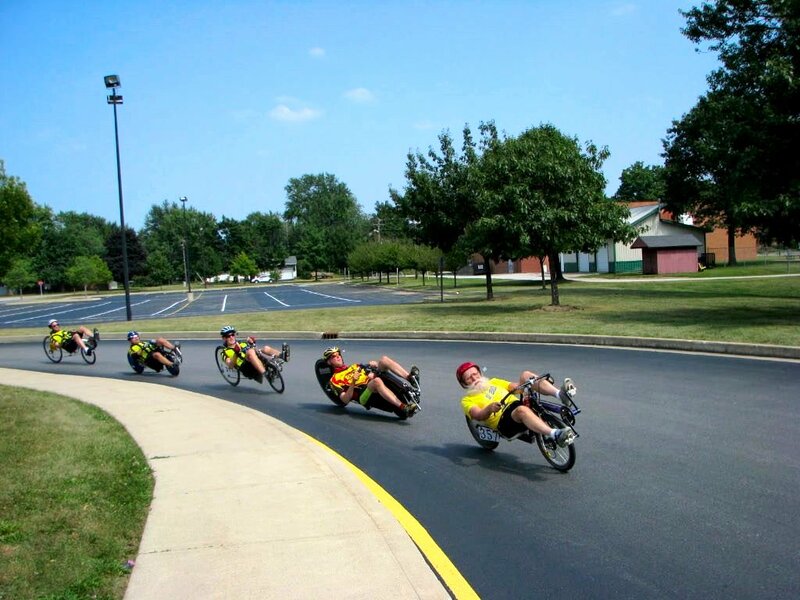 Trikes line up for a twisty race. 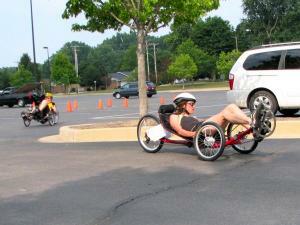 Photo by Jeff Hunn Reena takes a corner during the highly technical trike race. Dennis Grelk takes a corner on his leaner during the trike race. 3 man lowracer pace line led by Warren Beauchamp, followed by Jeff Hunn and Tim Hicks. Photo by Curtis Valey Warren races down the front straight with Tim drafting and Doc Pearson making the turn. 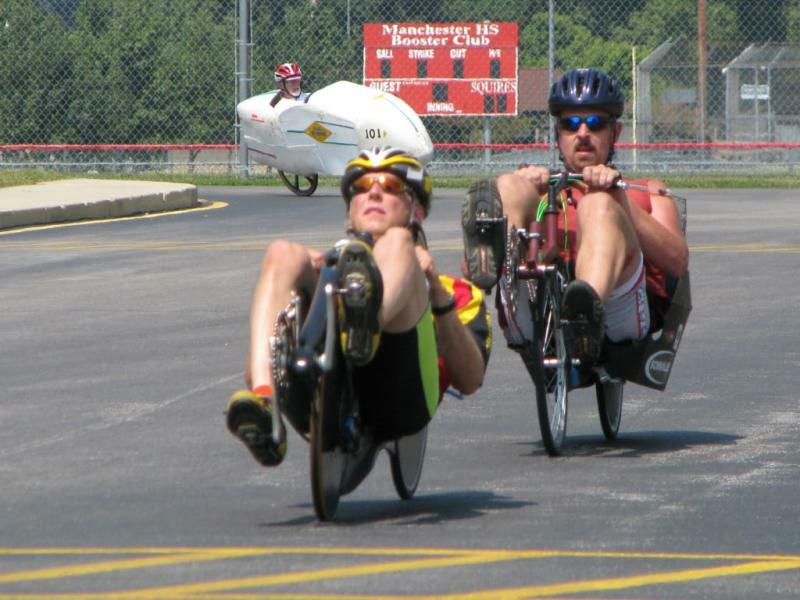 Photo by Jeff Hunn Warren chases Dennis, for a little while. 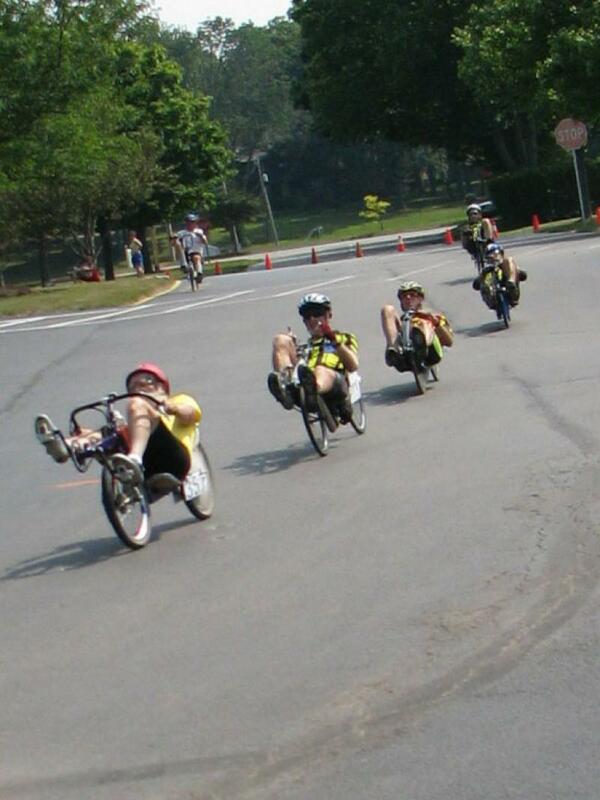 5 man lowracer pace line led by Rev. Bruce Gordon, and followed closely by Warren, Jeff, Chris, and Mike. 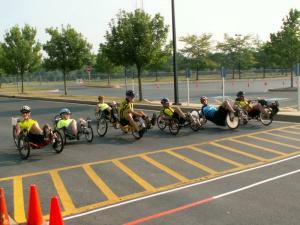 Racers took turns leading the pace line. 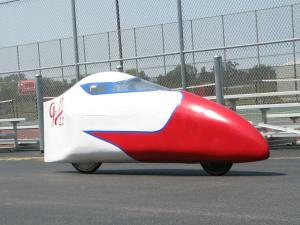 Richard Meyer in the Gee Bee Mini Moby. 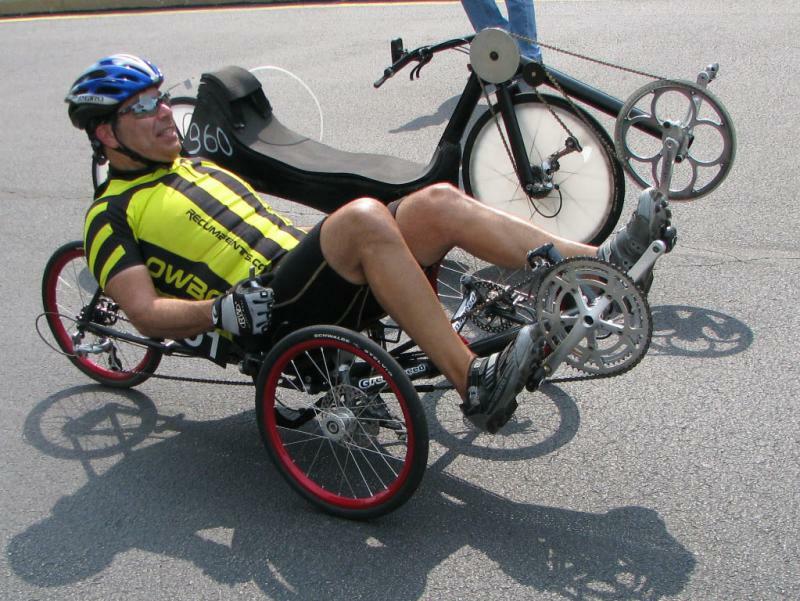 Rich just turner 73 years old! Rich prepares for a race in the Gee Bee Moby. Mike Mowett assumes "the position" if front of Garrie's NoCom tail fairing. Photo by Curtis Valey Rev Bruce Gordon and race director Jeff Hunn hang out under the tent. Jane Hunn races her Specialized road bike. 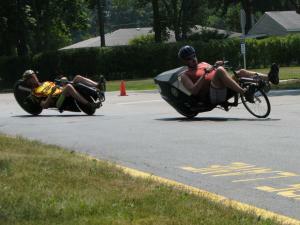 Bruce still leads. Riders switched off taking the lead. 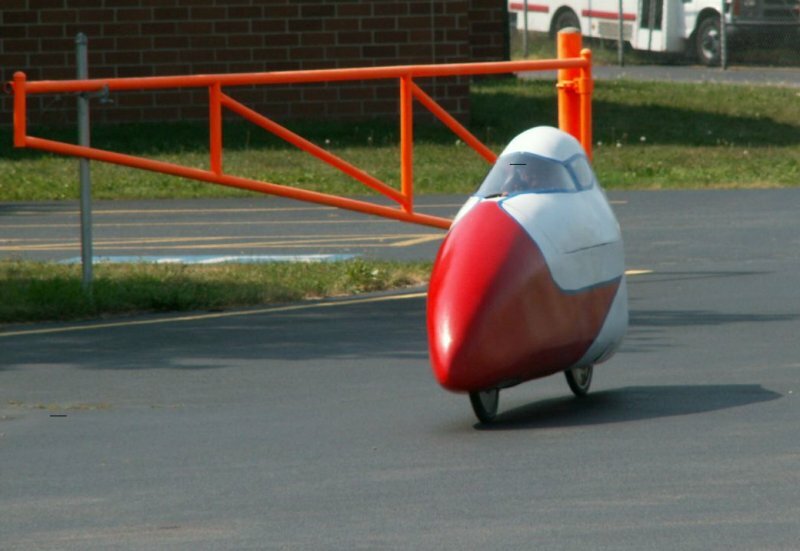 Warren eventually won the race. 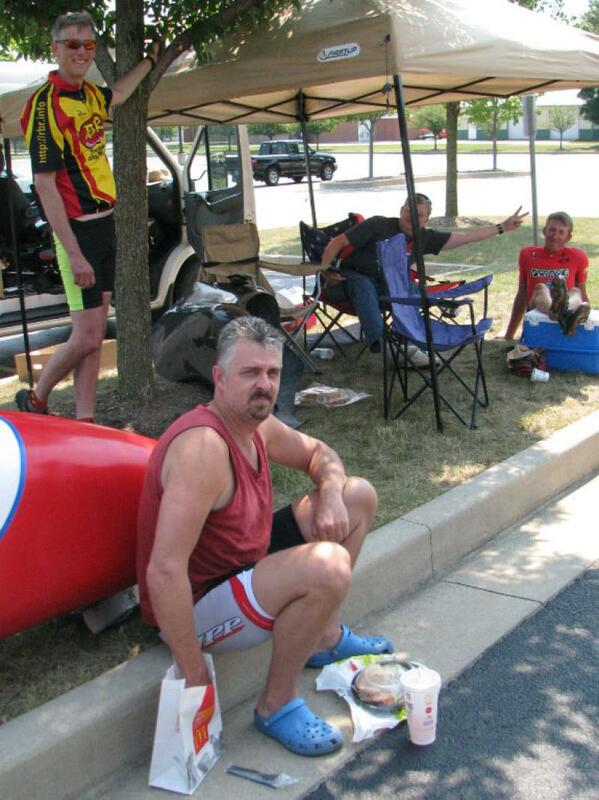 It was a hot day, and racers sought refuge in the shade. Sitting: Steve Wood, Dennis Grelk, Tim Hicks. Photo by Curtis Valey Here's Dennis Grelk's leaning trike proving that it can stand up by itself. 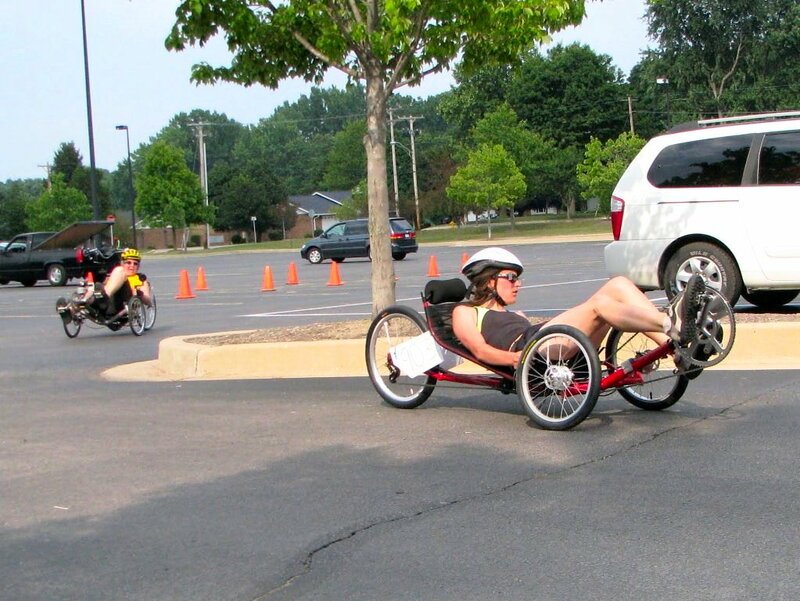 In the background is Steve Wood on his trike. 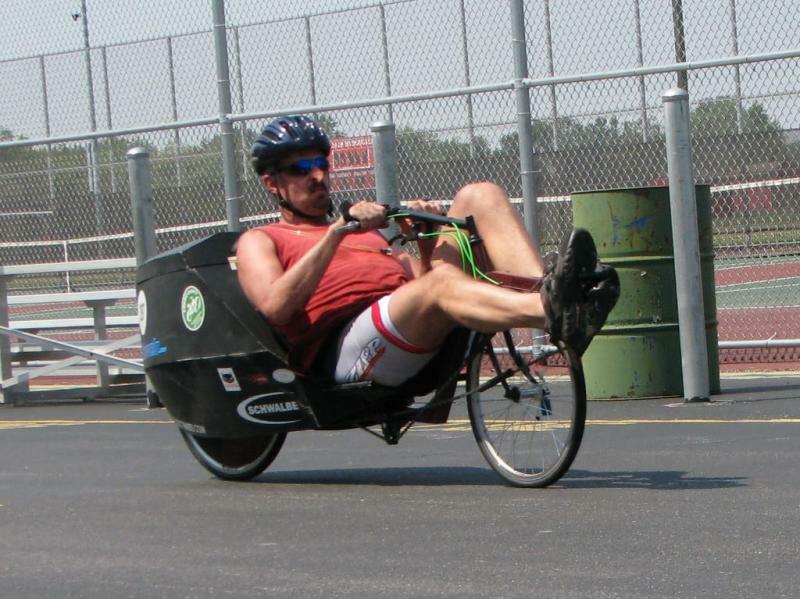 Chris Cortez on his low Greenspeed racing trike. 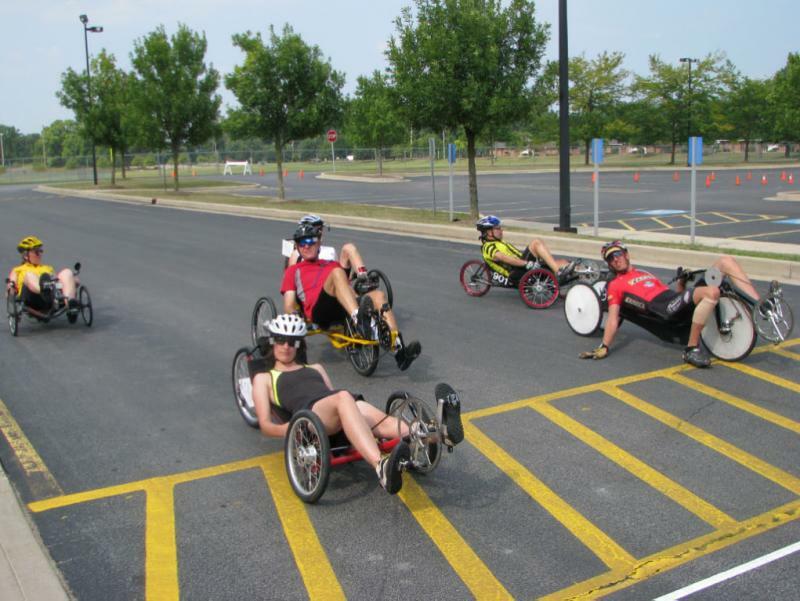 Photo by Curtis Valey Trike racers line up at the start of the twisty trike race. 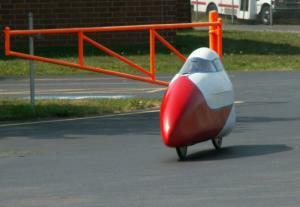 Reena Markstahler takes a corner at speed.